The other day I was directed to Phyllis' blog to participate in a Portable Studio/Destination Challenge which was to be held on Tuesday (yesterday). Well, I didn't quite get my act together in time, so I am posting it today. Last week Joy invited me over to work on a craft project. We decided it would be fun to make some soldered charms as it had been a very long time since either of us made any. Okay, I have to be honest. I haven't made any since I took Sally Jean's class. Pathetic, I know, but I think it has been even longer since Joy has made any. Anyway, I decided to pack up some art goodies to take over to Joy's and fortunately I had just the right container to do the job. My new little handled tin I got at the All Saints Church Christmas bazaar. As you can see, I packed it full of all sorts of neat items. 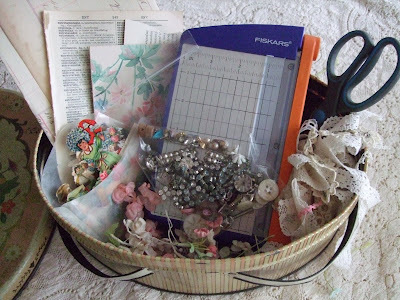 Buttons, lace, old mini keys, ledger paper, ephemera, rhinestone pieces, millinery flowers, etc. 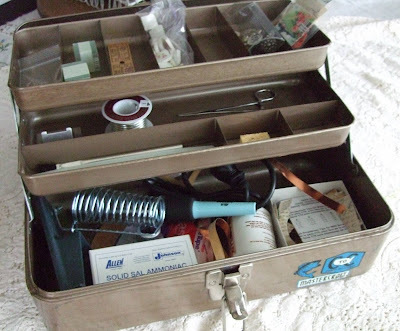 Not as pretty, but just as functional, is the vintage tackle box that is home to my soldering supplies. I love old tackle/tool boxes. They are great for holding all sorts of things. I use one for a money box when I do garage sales or small shows. I have another that I use for my rubber stamps and another for my tags and pricing items. I was all set to go to Joy's (my project destination) but when I got to her house, she wasn't there. Apparently we got our days mixed up and she was off running errands. She told me to go ahead and get started, which I fully intended to do, but then I got a call from my daughter telling me her school had a bomb scare and they were sending everyone home, I got in my car and headed home. I guess those soldered charms are just going to have to wait. We might try again next week. I do have a guest room/sewing room where I could work on projects, but it is a little cramped and I prefer to be where the action is, so I will sometimes take stuff to work on at the kitchen table which drives my husband crazy because I am naughty and sometimes leave my stuff out on the table for weeks. Crafting is fun, but so much better with a friend so I like to be able to throw stuff together to craft on the go. Totes are great for this too. I have lots of totes that I use for sewing projects that I'm working on either at home, at a friend's house or when we head over the mountain to see my in-laws. 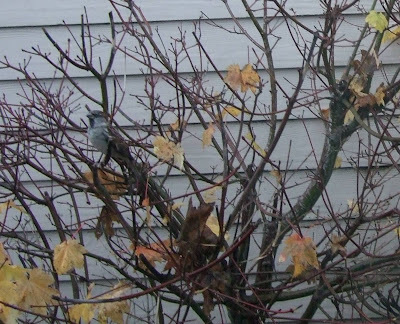 On a completely unrelated note, I want to leave you with this picture of a bird in a bush. I was in the drive through at McDonald's when I spotted this bush that had at least 6 of these birds in it. By the time I whipped out my camera, all but one flew away. Of course, after I pulled forward a bit in line, and could no longer get a good picture, I looked back and they had all returned. Silly. I hope you all have a truly wonderful Thanksgiving with your family and friends tomorrow! Oh, I'm a sucker for those pretty, handled tins! The feel like some reminder of my childhood that I can't quite put a finger on. 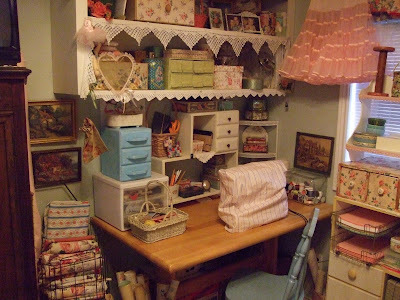 And look at that sewing room! How pretty! I think even messy it'll still look better than mine. Oh! I missed your name on the list but saw the wee icon had changed by your blog link...so I headed over and found a surprise! Love the tin packed with goodies! Hey. If your friend isn't there next time...you just keep driving, okay? Mapquest from Lisa's to Shabby's and it will tell you how to get here...k? Oh no! That above comment is from ME! I was doing surgery on Mary's blog and forgot to sign out! LOL. Have a great Thanksgiving to you and your family ! I hope you and your family have a relaxing, fun Thanksgiving!! Hi Lisa! Love that bird! 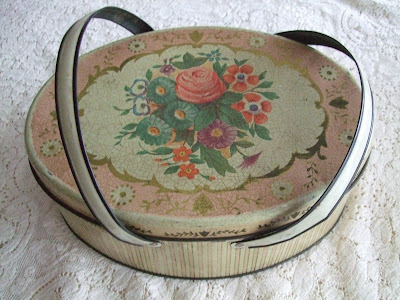 Oh, and I meant to say, your portable tin is soooo cute!